Recycling old sweaters might seem like one of those ideas that’s better in theory than reality. The truth is though, if you have some time on your hands and don’t mind getting crafty, there are a fair number of fun projects you can crank out if you happen to have a few of them stacking up in your closet that you just can’t part with. Here are eight workable ideas for recycling old sweaters. A friend of mine did this for her child in college using an old high school varsity sweater. Turning the sweater material into a pillow cover makes a memento out of something that otherwise would have been thrown away. Here’s a set of directions on making throw pillows from old sweaters, and another link for using patterned sweaters from the 1980s to make funky floor cushions. I’ve refinished dining room chairs with coordinating fabric remnants before, but sweaters are another fun strategy. Using chairs that have a padded seat only, you can unscrew the seat portion from the chair base and refinish that separately. I usually look for the second-hand chairs where the padding is still in pretty good shape. Then I only have to cut out a large enough piece of fabric to easily pull over the top to the wood underneath. A staple gun secures the fabric, and from there I reattach the seat cover. This article has some instructions and a visual on how to cover chair seats with old sweaters. In this age of grocery shopping at farmers’ markets and plastic bag reduction, having a few extra tote bags on hand is just a good habit to develop. Personally, I have a stash that I keep in the car, and one or two that I always have in my purse in case I’m riding with someone else. If buying new ones isn’t in your budget, or you’re just looking for a creative project for recycling a sweater that no longer fits, try turning your old sweater into a tote bag. There are several tutorials online, including the one I just provided and this sweater tote project from Canadian Living. So whip up a few for shopping or storage of your mesh produce bags. Of course, you could always use these for day trips to the beach and park picnics as well. Some of my favorite presents that I remember from childhood were homemade stuffed animals. Guess what? You don’t just have to crochet them anymore. These stuffed animals made from old sweaters are absolutely precious and can be made from special sweaters your child had when they were younger. For example, a holiday themed sweater from your child’s first Christmas, or a special one that Grandma knit would both be worth preserving in some form. So would the sweater your little one wore on his first day of school. Actually, if you’re looking for ways to preserve a family heirloom sweater, then Christmas decorations are a great way to go. They only come out once a year, so the odds of your sweater recycling project lasting for years, or possibly generations, are high. Try making these holiday stockings made from sweaters courtesy of Martha Stewart, or these felted Christmas stockings made from sweaters illustrated by Planet Green. I’ve also seen tree-shaped tabletop decorations made from sweaters that actually turned out pretty well. Here are some simple sweater trees with a more modern feel, and a different type of recycled sweater Christmas trees from the Sweater Surgery web site. If you happen to have a sweater to recycle that has a round pattern all the way around the neck, preferably in wool, then check out this Christmas tree skirt made from a sweater. If you start working these projects into your craft schedule early in the year, you’ll be all set when the holiday actually rolls around. Looking for a fun way to cover up those diapers you like to let the little one roam around in? Try these fun diaper covers made from recycled sweaters. Personally, I like the ones I’ve seen made from the felted, rustic wool sweaters in darker, colonial colors. I think they have an earthier feel to them, look nice and fit in with the whole cloth diapering scene in general. But choose a look that works for you. After all, it’s your recycling project. Sweater and mini skirt set. Personally, I’ve never met a teenage girl that didn’t like to try her own hand at fashion design. If you’ve got some sweaters that are headed for the Goodwill donation box anyway, consider this shrug and skirt set project from the folks at Threadbanger. If I were a parent, I’d want my daughter wearing the finished skirt project over a pair of leggings, but I’m conservative that way. 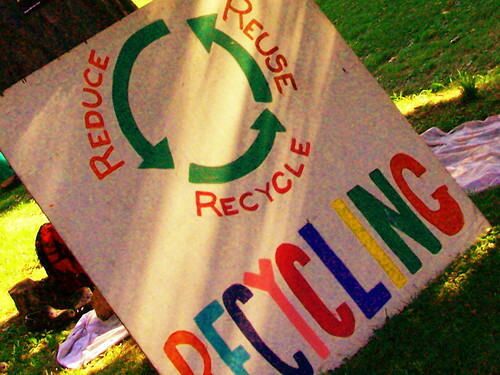 Regardless, it’s a fun recycling project that your teen is sure to enjoy experimenting with. If you’re looking to start from scratch, but want to save the energy that went in to creating the sweaters in the first place, consider these two ideas for having a fresh medium to work with as you recycle your old sweaters. First, if the sweater in question is made of a high quality yarn such as cashmere, unraveling it might be the best way to go. If there’s only a stain towards the bottom of one cuff, you’ve got the entire rest of the sweater to re-knit into a scarf, hat, gloves or other fun project. Best of all, if it’s a gift, it will look completely new. Here are some directions for how to unravel a sweater in order to reuse the yarn. Second, for wool sweaters, consider doing the unthinkable and running them through the washer and dryer. This will “felt” the material and turn it into something you can cut and sew with. Fun patches for your jeans, quilting squares and many other ideas are possible. Here is a resource article on felting to help you get started. As you can see, recycling old sweaters doesn’t have to be tacky or boring. Plenty of project ideas exist to repurpose this particular clothing item with panache and style. Love the pillow idea! Thanks for sharing. I usually wear my sweaters out or hand them down before I can turn them into anything cool like this.